Have you ever arrived at your travel destination and realized you forgot something small but important? We’re pretty sure we aren’t the only travelers to end a long day of cars, buses, airports and taxis with the realization your toothbrush didn’t make the trip. Amanda and I have found a great solution, we call it a “go bag”. The go bag is a toiletry bag filled with all of those must-have items that are so easy to forget in the last-minute rush to get out of the house. The bag we have is equipped with our shampoo, body wash, toothpaste and other bathroom items (in TSA-approved sizes, of course). We also add over-the-counter medications with long shelf lives, like ibuprofen and allergy medications. A go bag saves time and energy when you’re preparing to travel, too. You don’t have to search the house for what you need and make special trips to the drug store, looking for your favorite miniature bottle of shampoo. The concept does require a little discipline; you need to make sure to restock it when you return (we admit we’re not always great at this). 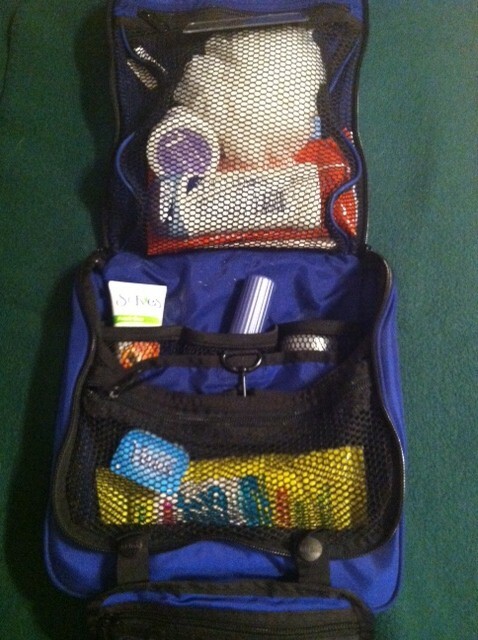 The idea is you want the bag to be ready to go for those times you have to hit the road on short notice. Yes, business travelers, we know you’ve been doing this for years, but those of us who don’t live the road warrior life find it a good way to be prepared. I will also admit the concept is attractive, too. When I see that bag sitting in the closet I feel a wave of wanderlust come over me and think of grabbing it and Amanda and running away somewhere just for the hell of it. Did we miss anything? What are your go bag essentials? Do you have a go bag style or brand you love? Do tell!